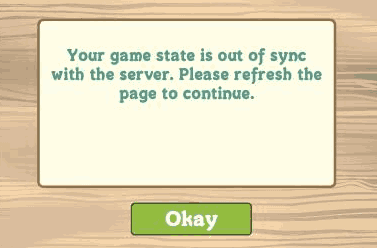 How can you fix Farmville “Out of Sync” errors which force you to refresh and lose unsaved Farmville game data which in turn makes you redo all the moves again. Farmville is one of the most popular games on Facebook and we are also Farmville addicts bugged by the Out of Sync errors often. Here are some common causes which ‘may’ cause these Out of Sync errors and here are some ‘possible ways’ to fix and avoid these “Out of Sync” Errors. 1. Dont Open Farmville in Multiple Tabs / Windows – As the game progresses, we tend to open multiple Farmville in multiple tabs and windows which causes the game to get out of sync in one of these tabs if it fails to refresh and keep track with changes in the other tab. So keep only one window or tab open and this will be avoided. This is more prone to occur with Farmville players with extra large farms with hundreds of animals, trees and crops which requires more syncing by the Farmville servers. You can also play on Farmville.com and not necessarily on the Farmville Facebook app, so keep either one of them open only. 2. Use fast broadband internet connection – Farmville involves lot of data transfer, and if your connection keeps dropping packets, is slow and unable to sync fast enough with their servers as you hurriedly plant crops, you will get the out of sync errors. Try to fix your DNS to Google public DNS or Open DNS for better results. 3. Clear browser cache – Sometimes your inefficient browser cache can confuse Farmville with an outdated cache copy and cause out of sync errors. If refreshing / reloading Farmville does not work, delete your cache, restart your browser and you should be fine. 4. Update your Flash Player – Many times your browser flash player is outdated and unable to cope with the Farmville server refreshes and its latest version. You can visit the Adobe site, and download latest Flash player for your browser and enjoy Farmville. 5. Farmville is Beta – have you noticed the big “beta” beside the Farmville logo, well it is meant to signify that Farmville acknowledges that there still might be bugs and they are considering feedback of users to improve the game. These are some common causes we believe may be causing the Out of Sync errors, they may or may not work for you but definitely worth a try.